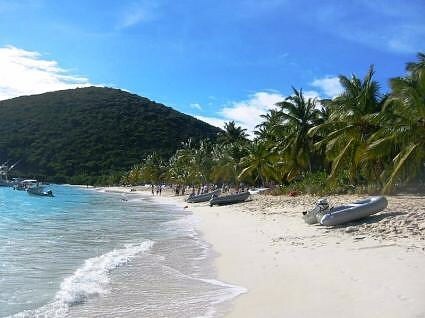 Over on Jost Van Dyke, in White Bay, is the Sandcastle Hotel, home of the infamous Soggy Dollar Bar, so called as most visiting patrons must swim ashore to visit. As unless you are a hotel guest, there is no dock, and the hotel owners intend to keep it that way. Thus, at anytime, there may be patrons at the bar, somewhat soggy, paying with somewhat soggy dollar bills. 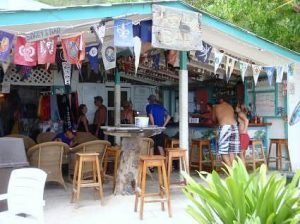 However the Soggy Dollar Bar’s real claim to fame is as the birthplace of the Painkiller cocktail, appropriately named for the amount of rum buried within this concoction masquerading as a lovely tropical fruit drink. 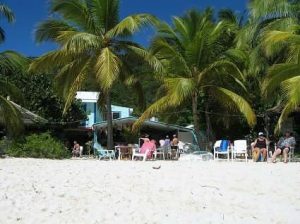 The Painkiller is a well known cocktail to any long time BVI sailor. Unique to the BVI’s as it is made with Pusser’s Rum the BVI rum, this cocktail can now be found in several BVI island locations including Pusser’s Restaurants. At the Pusser’s Restaurants, the Painkiller is ordered by number, which relates to the number of shots of rum poured in the cocktail. So be careful of Number 4 as you know what that means! The Painkiller is a combination of dark rum, generally Pusser’s Rum, cream of coconut and pineapple and orange juice, all topped with freshly grated Grenadian nutmeg. The exact proportions of each within the Soggy Dollar Bar Painkiller is said to be a secret. If you make it to the Soggy Dollar Bar on your charter, be sure to swim in for an original Painkiller and play a round of the Ring Game, a simple Caribbean bar game found throughout the Caribbean of swinging a ring to catch on a hook. Sounds simple, but can keep you busy for some time while enjoying rounds of Painkillers.Visit the Northrop and Johnson Website For More Information!